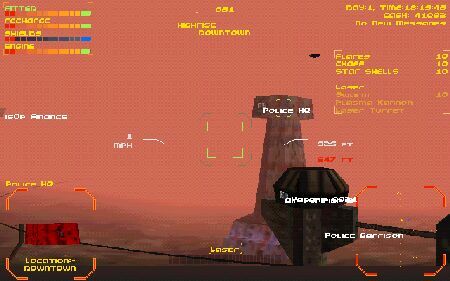 The Police have an outpost in nearly every crater: Downtown, Highrise, Riverside, Gamma, and Alpha. You can find the nearest Police Station by checking your Local Services Menu. Above is a picture of Police HQ in Downtown. The Police don't buy anything. It's rumored they're maintained primarily by the Lazarus family. They do however have their Wanted List of pilots with bounties varying from $500 - 2000. If you're new to piracy, it's a good idea to lock in several pilots on the Wanted List before looking for prey. You can kill these Wanted Pilots to clear your record with the police for your piracy without having to pay them a fine.